Posted in: 1 Pageant Pages. 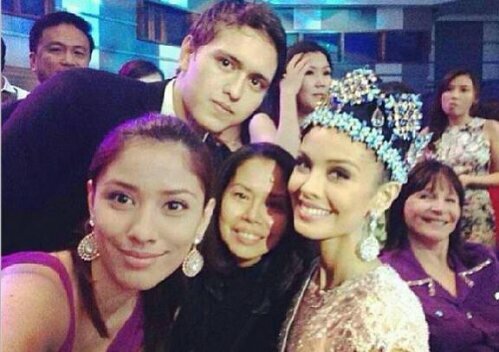 Tagged: Carranza Shooter, Marine Lorphelin, Megan Young, Miss World 2013, Sancler Frantz. Before we close the chapter of Miss World 2013, let us take one final look at the candidate who almost won Miss World 2013 and gave our Megan Young one tough fight for the crown. Even our bet admitted that Marine Lorphelin is her toughest competition. Ask Megan and it’s only France that stood out in her mind as the fellow delegate with the excellent chance of snaring the title that, thankfully, landed our way. There was a point during the homestretch when some quarters (including your blogger) felt that Marine was no longer a threat, and that Sancler Frantz of Brazil stood the best chance of winning outside our own. But the uber gorgeous Frenchwoman was not to be denied a clear shot at the crown. She blazed the stage and fought side-by-side to prove that, once and for all, it’s either her or Megan only for the win. And her perceptions turned out to be right. She landed 1st Princess honors to the candidate she was most preparing for since Day 1. Congratulations are also in order for Marine Lorphelin – one of the loveliest modern-day Miss France winners ever. If she ends up travelling parts of the globe with our Megan, then I’m pretty sure they will it off well. En vous souhaitant bon courage dans la suite de vos recherches! (Best of luck in your endeavors!) 😉 – I hope that went right. Posted in: 2 Shout-out-Looks. 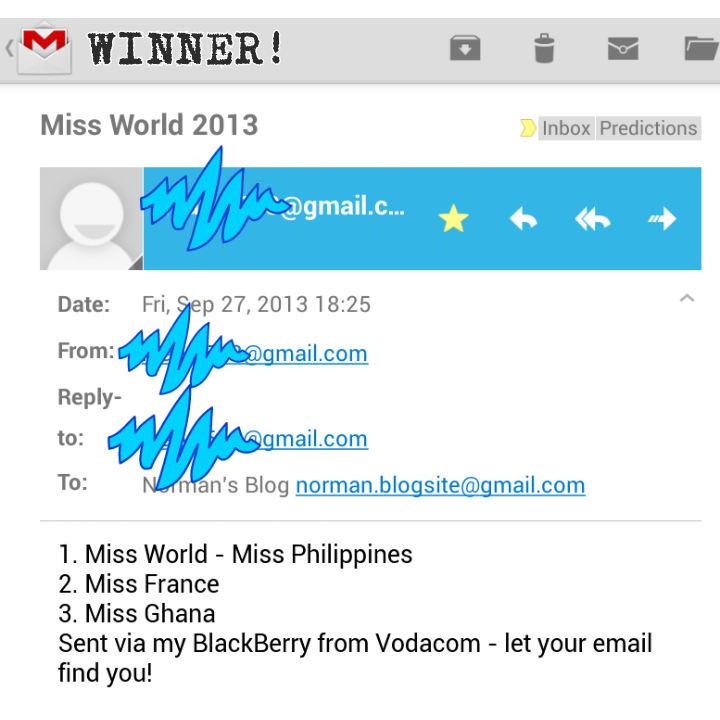 Tagged: Christian Mercado, Mary-Elizabeth Coetzee, Miss World 2013, Norman's Blog. Our winner all the way from South Africa! 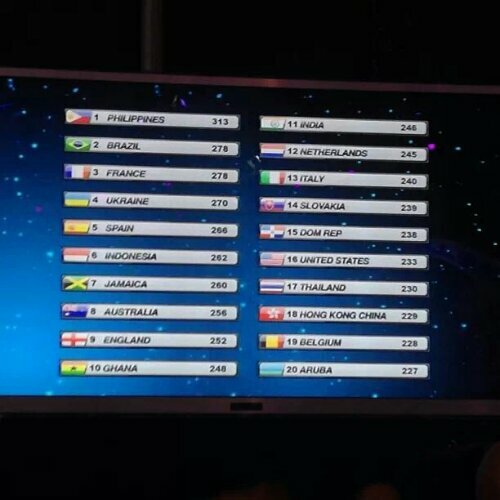 And you thought nobody got the right combinations from a total of 247 entries? Well, there is definitely one who submitted 100% accurate predictions. And this individual beat the deadline (September 27, 7:30PM) by just a little over an hour. She is not from the Philippines. She is not from anywhere around the Asian region. She’s not even from the US or Canada. She participated in my contest all the way from Bushmansrivermouth, Eastern Cape, South Africa! 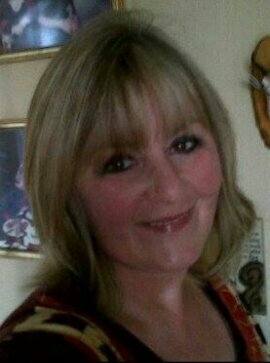 Let’s give it up for international reader Mary-Elizabeth Coetzee! “Wow, I am soo pleased I predicted the top 3 in correct order. 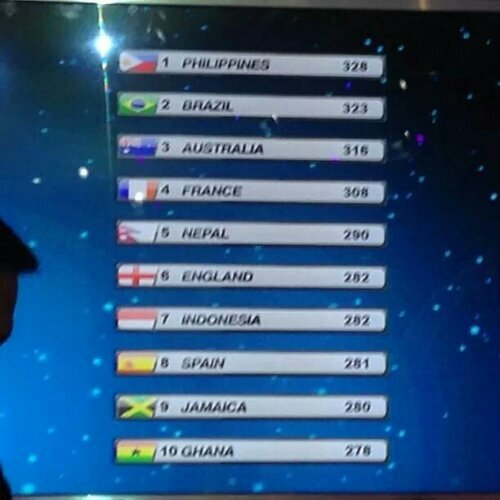 I know Miss Ghana was an outsider, so well done Africa, France + of course Congrats and well done Megan Young of Phillipines (sic). 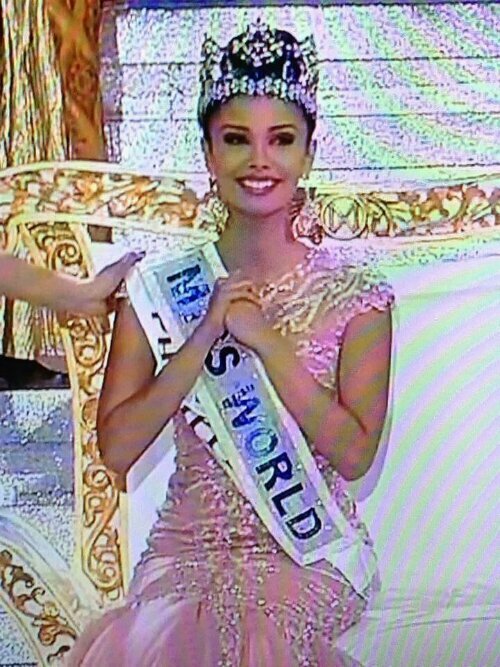 U deserved the Crown and by far the most beautiful Miss World ever !! !” gushes Ms. Coetzee after I informed her of the good news. 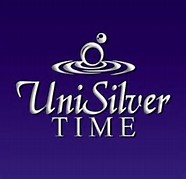 In just a few, she will be receiving her USD100.00 gift card from Amazon.com. And since we do not have a Philippine winner for the part of the prize package that can only be redeemed locally, I decided to give a consolation prize to one entry. He got all three (3) ladies right, except that he switched Misses France and Ghana. I gave more weight to the part that he got the cast complete. And he is reader Christian Mercado. 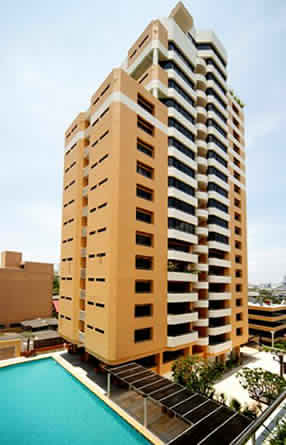 He will receive the P2,000.00 gift certificate from Beverly Hills 6750 and a Starbucks Card (with P500.00 stored value). I already coordinated with Mary-E regarding her prize. 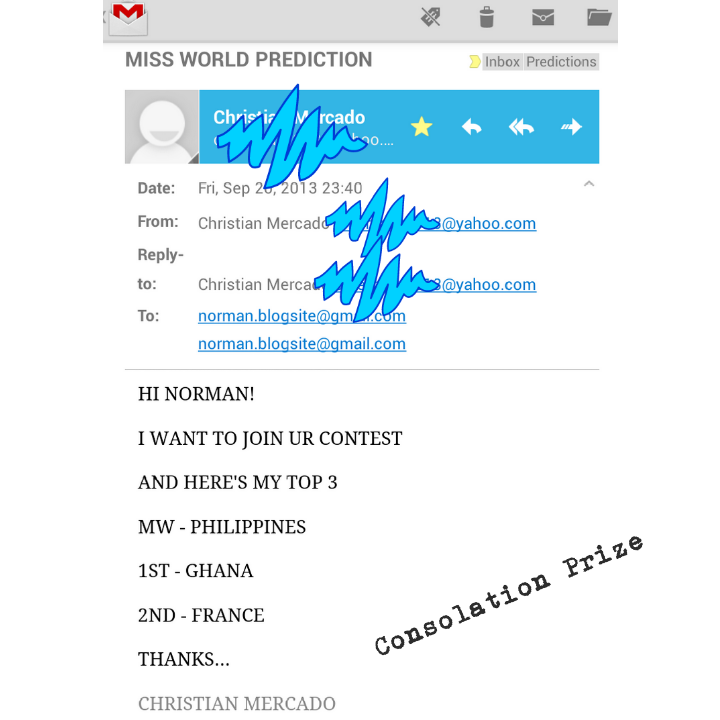 However, our consolation prize recipient – Christian Mercado – has not replied to my email yet, so I’m giving him a few more days to confirm mailing details. Otherwise, I might have to select another one. Posted in: 2 Shout-out-Looks. Tagged: Aces & Queens, Janine Tugonon, Jonas Gaffud, Megan Young, Miss World 2013. 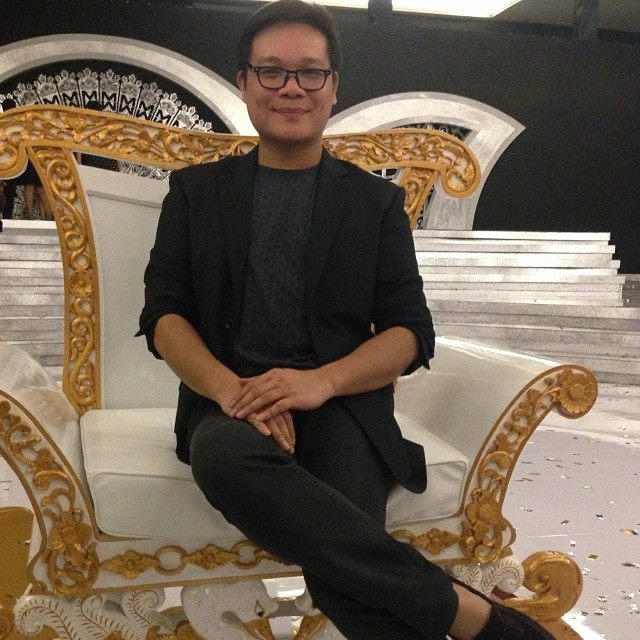 Jonas Gaffud sitting on the Miss World 2013 throne. Aside from Megan winning Miss World 2013, this is also a well-deserved victory for Aces & Queens headed by the indefatigable Jonas Gaffud. 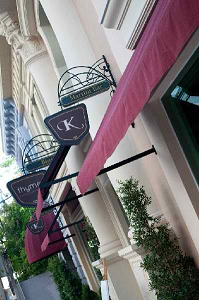 The beauty camp can now finally and proudly say that they have produced a big winner in global pageant history. Honestly, it was only a matter of time before one of their own snatches a major victory. 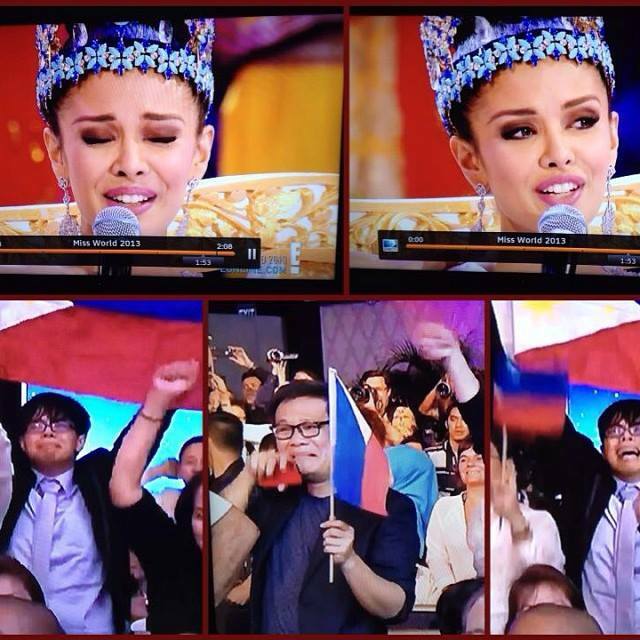 I thought that it would happen during Miss Universe 2012 when Janine Tugonon came so close to winning the Diamond Nexus Lab crown in Las Vegas. Unabashedly crying after Megan won, Jonas Gaffud (below center) with Mark Besana (below left and right) of Aces & Queens feel the triumph of Megan’s win. Patience is truly a virtue, and with rewards to boot. The group had to wait more than nine months before realizing that dream in Bali, Indonesia. And what a glorious vindication it came to be. Now that the precedent has been set, the succeeding pressures will be greater, more intense if you will. It’s like winning a 1st Gold in the Olympics and getting hold of the 2nd, 3rd, 4th or 5th will become such a daunting task to accomplish. Posted in: 2 Shout-out-Looks. 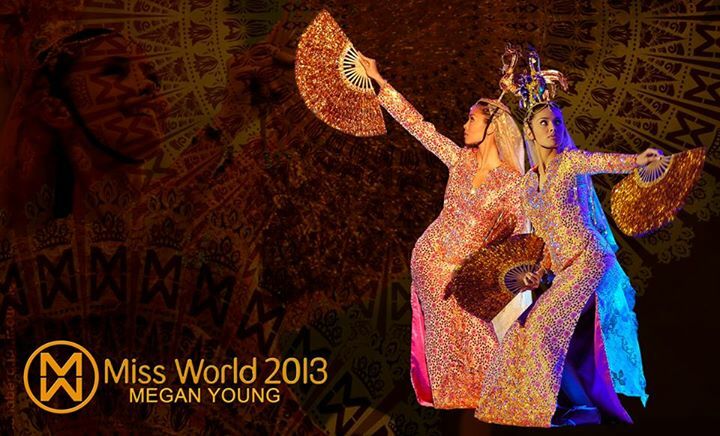 Tagged: Megan Lynne Young, Miss World 2013. Posted in: 1 Pageant Pages, 2 Shout-out-Looks. 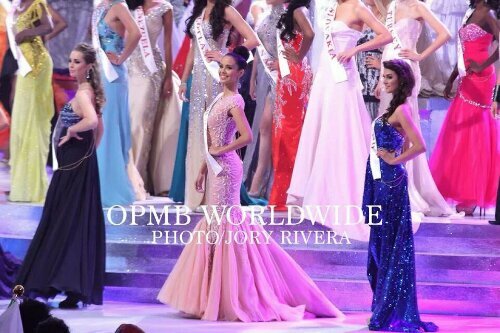 Tagged: Julia Morley, Megan Young, Miss World 2013, Wenxia Yu. Do you know the feeling you get when something BIG and wonderful is about to happen and still, you’re not sure how to react to it? That was what happened to me last night. All the signs, all the positive developments and all the predictions have collectively pointed to Megan Young winning the Philippines’ first Miss World crown days before the finals night itself. 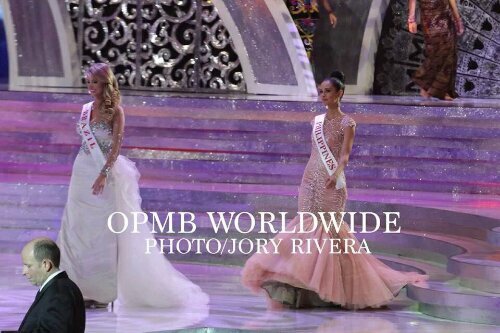 And when she was actually called by Julia Morley as Miss World 2013, I wanted to shout to the top of my lungs. I also wanted to hug the person next to me (my mom, in this case). I did all that. But I started sobbing with a smile on my face first. The tears started flowing down my cheeks as if I had actually been in Megan’s place. 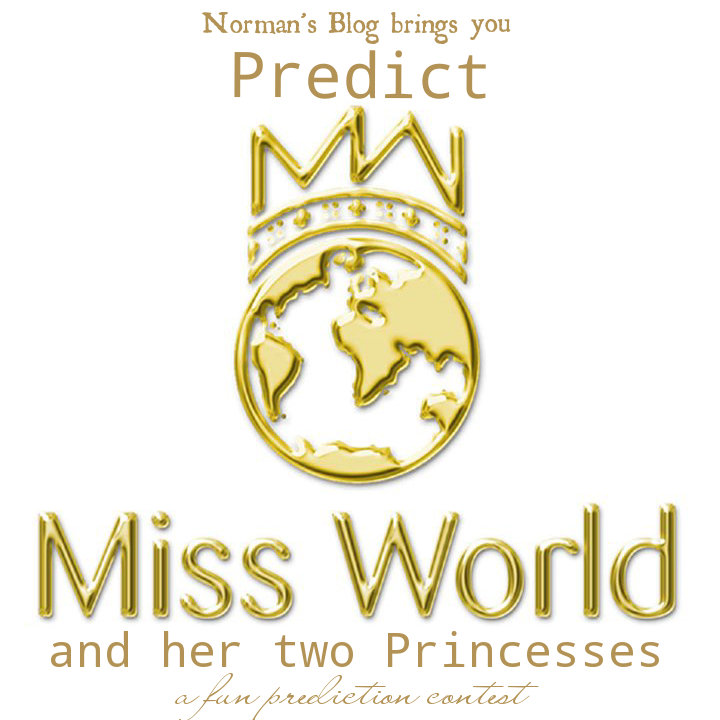 The last time we won a title as big as Miss World (and that would be Miss Universe) was 40 years ago (Margie Moran) when I was just beginning to take interest in beauty contests. And when host Mylene Klass interviewed a still-visibly stunned, shaking and tearful Megan while seating on her throne, one of the latter’s answers really caught my attention. Strong words. A strong promise. And I bet she will deliver on that commitment. And Julia Morley’s smile will have meant that the rightful winner has just been crowned. 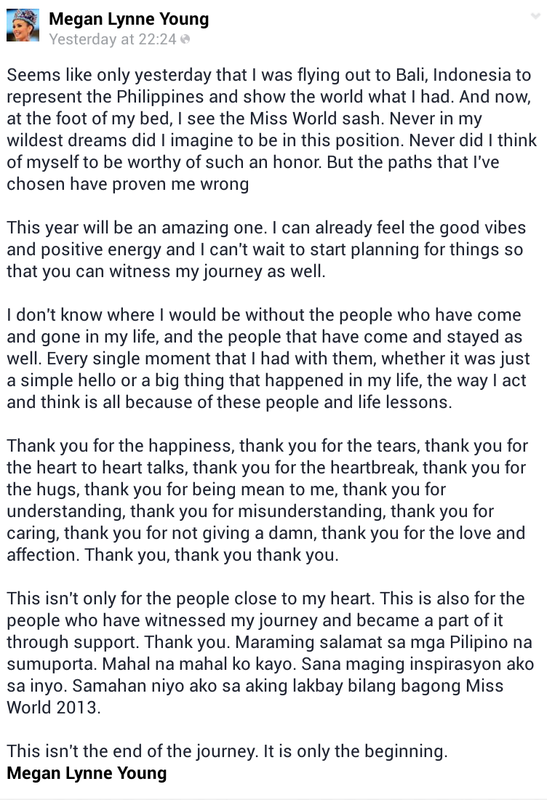 From now till somewhere around the tail-end of 2014, Megan Young’s life will dramatically change. International travels. Fund-raising activities. Charity visits. Personal appearances. And a flat in London. Just like her predecessor Wenxia Yu who has grown close to Julia, our Megan will most likely find a second mother of sorts in the pageant matriarch. Together, they will lead a purposeful year that will definitely open more doors for new challenges to take and opportunities to consider. In closing, let me take this space to formally write my apology to Miss World 2013 for having doubted her resolve to seriously joining a beauty competition. I even tagged her as someone who cried wolf when she was neither here nor there in enlisting for Bb. Pilipinas, not knowing that fate has a greater plan for her somewhere else. I know that she has the kind heart to understand where I was foolishly coming from at the time. Left to right: sister Lauren, brother Victor and mother Vicky celebrate Megan's victory with Julia Morley in the background. Now I know Megan better. After what I have witnessed from the time she won Miss World Philippines 2013 to her eventful weeks of stay in Bali all the way to becoming the first Filipina to wear the blue crown, there is no doubt that she is indeed poised to become the best Miss World ever. Our Megan during the introduction of candidates. Looking every inch the loveliest woman of the night, our Megan is. Megan during her solo spot for Dances of the World. So concentrated. All scores will be reset to zero for tonight's finals. Megan is #1 in the Top 10! Ukraine bids my Five-for-Fighting circle goodbye. Back to zero for the Top 10! But the Top 5 and People’s Champion will be announced next! 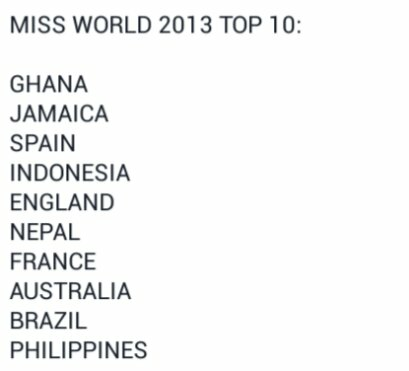 Megan Young makes it to Top 5!!! The four others who made it are France, Ghana, Brazil and Spain. 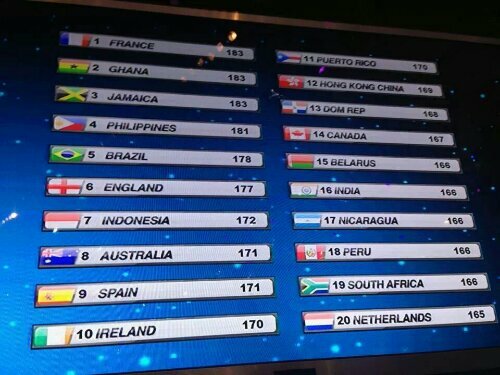 Gibraltar makes it as the People’s Champion. It’s now the Top 6! 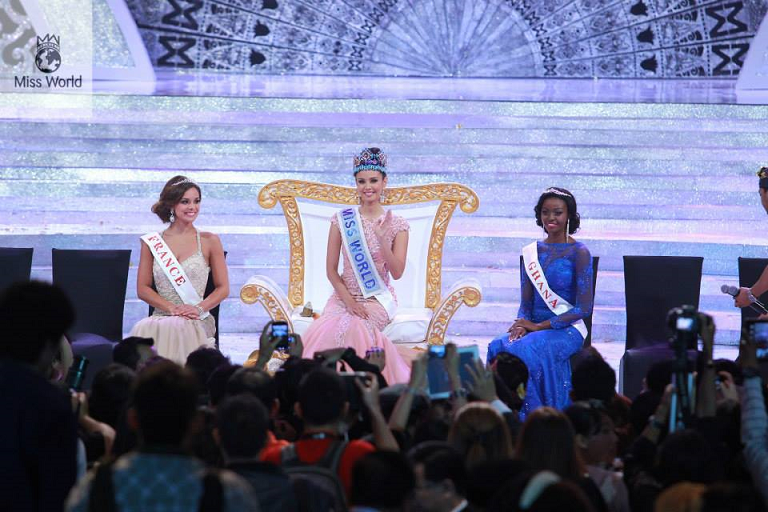 Megan Young is now Continental Queen of Asia-Oceania! Megan gave a most impressive Q&A! 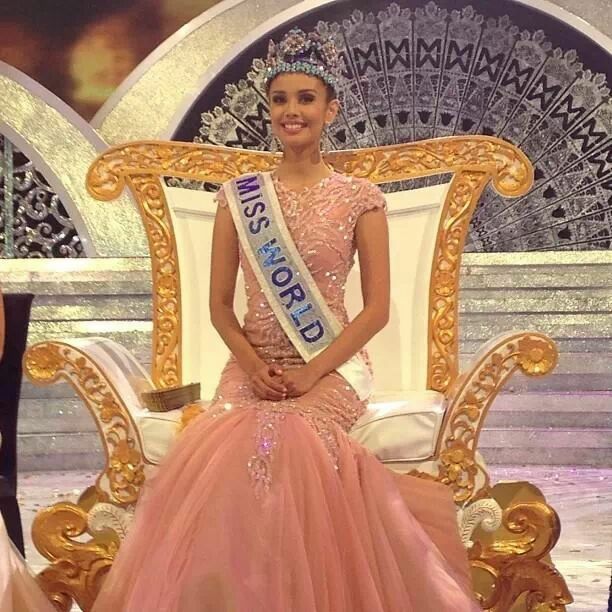 And Miss World 2013 is……..
You are Miss World 2013....Philippines!